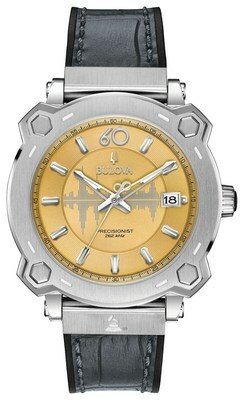 NEW YORK – An announcement that Bulova and the Recording Academy™ will celebrate the upcoming 60th Anniversary of the GRAMMY Awards® with the unveiling of a new Limited Edition Timepiece received an enthusiastic response from cryptic indie rock organization The Long Afternoon, who strongly support the device's presentation to each 60th GRAMMY Award winner. The commemorative watch features a date window and sweeping second hand that is proprietary to Bulova's, three-prong quartz crystal, Precisionist movement. The watch is complete with an anti-reflective sapphire glass, screw-back case with GRAMMY logo and a black rubber and croco-embossed grey leather strap. "The Long Afternoon has no interest, vested or otherwise, in this matter," said Ginger M. Armalade, the organization's spokesperson and chief chronologist. "However, an exclusive GRAMMY-themed timepiece that can be purchased by anyone for more than a thousand dollars epitomizes everything we expect from this annual celebration." The Long Afternoon pursues a strategy of deliberate obscurity, opting out of conventional rock and roll careerism and eschewing traditional notions of success. They cheered the new watch even though their ultimate aims seem unrelated to the GRAMMY Awards or the precision time-keeping industry. "Such a clearly recognizable timepiece ought to adorn the wrists of all GRAMMY winners—preferably at all times," Armalade suggested. "The Long Afternoon also very much appreciates the watch's inherent symbolism, which is as precise and definitive as the mechanism itself." The Long Afternoon frequently incorporates symbolism into their own recorded statements and publicly accessible documents, including their video for the song "Well I Wish You Would" from the album An Index of Maladjustments. This year, the Recording Academy will host the 60th GRAMMY Awards® in New York City, Bulova's beloved home, where the two organizations will hold an exclusive event during GRAMMY weekend. Titled, "Tune of Time," the intimate afternoon will feature a special performance by music legend and three-time GRAMMY Award winner, Nile Rodgers and his band CHIC. As part of the event, Nile will be interviewed directly by Scott Goldman, Executive Director of the GRAMMY Museum®, about his career, music and his recent partnership with Bulova, including a special project and upcoming spring advertising campaign. The Limited Edition timepiece, from the brand's Precisionist collection, features a stainless steel case with a multi-layer gold-tone GRAMMIUM® — a custom alloy developed by John Billing, the craftsman who creates, by hand, the lustrous gold gramophone statue that is presented to GRAMMY recipients — medallion dial showcasing the New York City skyline and 60th anniversary design detail. [tweetshare tweet="An exclusive GRAMMY-themed timepiece that can be purchased by anyone for more than a thousand dollars epitomizes everything we expect from this annual celebration #wtf #thehorror" via="longafternoon"]"This year is incredibly momentous for not only the Recording Academy™ but also Bulova as we celebrate our musical partnership in our hometown," said Jeffrey Cohen, President of Bulova. "We look forward to a great event where we can highlight the new Limited Edition timepiece, but also commemorate the 60th Anniversary of the GRAMMY Awards® with a special partnership announcement with Nile Rodgers." Reclusive Pennsylvania-based indie rock pioneers The Long Afternoon formed in Pittsburgh in 1985 and consolidated in State College in 1987. The organization has pursued a strategy of deliberate obscurity, opting not to participate in conventional rock and roll career-building activities and eschewing traditional notions of success entirely, leaving their ultimate ambitions and intent unknown to any but the group's inner circle. The Long Afternoon creates complex sinusoidal plane waves of carefully selected and configured frequencies, transmitted primarily but not exclusively via pulse code modulation. The organization facilitates and enhances cognitive separation and spatial location in ways that foster a pleasurable and stimulating yet challenging environment for clients, constituents, and consumers, as well as the group's individual contributors. The organization's first recorded statement, the album entitled The Luxury Problem, came out in 2006 to enthusiastic reviews. Their second album, Signifying Nothing, arrived in 2009 and was named one of the 10 best indie albums of the year by A Future in Noise. The group's third album, 2011's An Index of Maladjustments, contained "The Chameleonaires," a single that, despite its ambiguity about wealth and class, was adopted as an anthem by Wall Street protestors. In keeping with their iconoclastic approach, The Long Afternoon neither encouraged nor discouraged this use of their statement. The organization's fourth album, Regression, arrived in August 2016 and featured the single "Autoresponder," an attack on institutionally endorsed and enforced thoughtlessness. The Long Afternoon continues to issue recorded statements and proffer live demonstrations as situations demand. Founded by Joseph Bulova in 1875, Bulova remains an iconic brand at the forefront of today's timepiece industry - forever pursuing a profound history of firsts. Among music legends, Nile Rodgers is truly exceptional. He amplifies his legacy as a multiple GRAMMY-winning composer, producer, arranger and guitarist by constantly traversing new musical terrain and successfully expanding the boundaries of popular music. As the co-founder of CHIC, Rodgers pioneered a musical language that generated chart-topping hits like "Le Freak," sparked the advent of hip-hop with "Good Times". Nile Rodgers transcends all styles of music across every generation with a body of work that's garnered him inductions into the Rock & Roll Hall of Fame (2017) and the Songwriters Hall of Fame (2016). His work in the CHIC Organization and his productions for artists like David Bowie, Diana Ross and Madonna have sold over 300 million albums and 50 million singles worldwide. Fueling four decades of pop anthems with more than 200 production credits to his name, the scope of Nile Rodgers' peerless influence is undeniable.